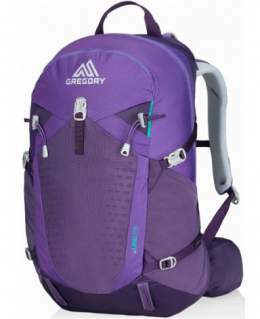 Gregory backpacks for women include many packs from several famous series, so here you have their 7 best representatives in the range 25 – 70 liters. Women’s outdoor backpacks are in series with 2 to 5 packs in various sizes. In addition to this, each nominal size includes 2 and sometimes 3 sub-sizes, so you have many packs. For example, the Maven series is in 4 nominal sizes and within each of them you have 2 sub-sizes, the Deva series is in 3 sizes and you have 3 sub-sizes in each, which means 9 packs, etc. I thought it would be useful to have the best of them at one place as a reference, so I give them below together with some basic data. But if you would want to read more, please follow the links to my detailed reviews. Gregory Juno 25 hydration pack. 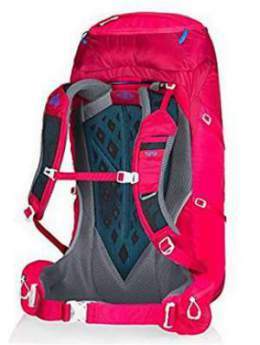 This Juno series for women is a counterpart of the Citro packs for men. So the Juno is built in the sizes of 20, 25, and 30 liters. This is a daypack and the name tells you the big bonus which you get here – the hydration bladder. This is a 3D 3-liter Hydro reservoir, BPA-free Gregory’s proprietary QuickDry soft-molded system with a magnetic DryLock bit valve. This tiny pack comes with an internal frame that includes a 4 mm spring steel wire and an HDPE sheet, and on the back, you have what they call the VaporSpan system with moisture-wicking technology and a suspended mesh. 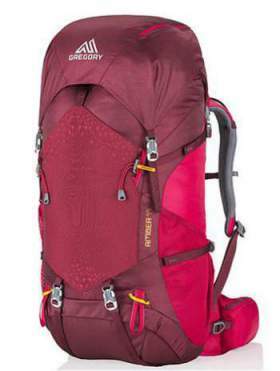 So this is a strongly built pack suitable for fast and light hiking and mountaineering day tours. You have 7 pockets here, and these include two zippered hip belt pockets, who would say for such a small pack. There is no rain cover here. Gregory Maven 35 pack for women. The Maven is a massive series of many packs and these include this 35 as the smallest and also Maven 45, Maven 55, and Maven 65 pack. You should know that they have a parallel series for men under the name Paragon. This is a lightweight series, but these packs are loaded with features. They have all that you need. Now, the smaller packs in the series, the Maven 35 and Maven 45 do not have some features which are available in the bigger packs. This is why I have also added the Maven 55 pack below. So the Maven 35 comes with an adjustable harness, and it is also built in two sizes. Its best part is its suspension system which is based on a metal frame, and the back is what they call Matrix Ventilation with many cut-outs in the foam panel, covered by a suspended mesh. You have 5 pockets, a rain cover is included, and believe it or not, you also have a bottom access together with the top access under the lid. Gregory Amber 44 pack for women. The Amber series is women’s counterpart of the Stout series from Gregory. So this is again a large series with 5 packs, you can see my review of the Amber 60 as well. The Amber 44 has been on the market for a few years already, but it has been thoroughly redesigned in 2017. This pack is built in one size, but the harness is fully adjustable and you can dial your best fit, all is based on a Velcro hook and loop connection behind the harness. 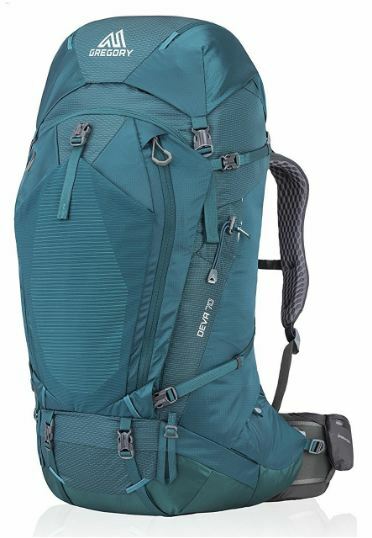 The pack is very lightweight, so you have only 2 lb 12 oz (1.25 kg), but it is full of features. You have access from the top and from the bottom, the rain cover is included, the lid is floating type, there are 7 pockets in total. The pack is a bit similar to the packs from the Maven series. Please read more in my review. Gregory Octal 45 pack for women. The Octal series is a women’s version of a brand new product by Gregory which they launched in 2018. The Octal includes the 45 and 55 liters packs. Note that the version for men is the Optic 48. This is an ultra-lightweight series, the lightest that Gregory has built so far. 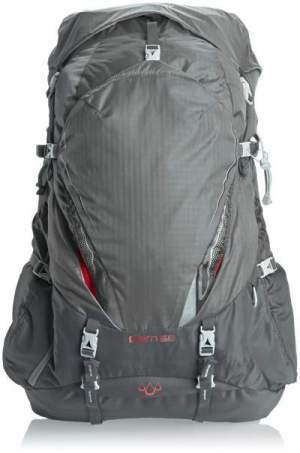 The weight which is around 2.4 lb (1.09 kg) and the pack is still loaded with great features. This pack is great for weekend or overnight hiking and backpacking tours, perhaps even for day tours if you carry more stuff, like in a cold weather area with more layers of clothes, waterproof stuff, etc. You have a great suspension system with an excellent padding on the shoulder harness and on the hip belt, but the harness is not adjustable. Instead, you have three sizes to chose. The best part of the suspension is the tensioned mesh on the back, which completely separates the pack from the body and you have free airflow in all directions. This is the best ventilation of all packs here. The access to the main compartment is from the top, and the lid is removable. In such a lidless use, you can close the pack with a FlapJack which is included. I should stress that the rain cover is also included, and the pack has 5 useful pockets. Gregory Maven 55 pack for women. You have already seen the smaller pack form this Maven series above; this Maven 55 includes all that is available in the smaller pack but it has plenty of extra features. First to realize that this is a lightweight pack for its size, the weight is around 3 lb 5 oz (1.5 kg). The pack is also built in two sizes and it comes with a rain cover. The harness is fully adjustable, but you also have an adjustable hip belt; the latter implies that you can detach the hip fins and reposition them to fit your body size. The internal reservoir sleeve is removable, and it doubles as a daypack. Note that the bottom compression straps on the big pack are removable and can be used as the hip belt for that daypack. The pack has an internal divider between the bottom compartment and the main compartment; this divider is removable and it is designed to be used as a flap for the pack in its lidless use. You have 7 pockets here, plus the pocket where the rain cover is stored. Attachment loops are available on the lid for a solar panel, and on the shoulder strap you have the QuickStow attachment for the glasses. Gregory Cairn 58 pack for women. The Cairn series is built in the sizes of 48, 58, and 68 liters, so here I show the mid-size pack. Note that within each of the three main sizes, you still have 3 sub-sizes. So this nominal 58 liters size also includes the packs of 56 and 60 liters. My feeling is that this series is a bit overshadowed by the more famous packs from the Deva, Maven, and Amber series, and this is a pity because the Cairn packs are quite unique and exceptional design packs. The access to the main compartment is from the top and from the side, and you do not have a separate bottom compartment. The harness is not adjustable and this makes it different from the Maven packs. But Cairn series has a great storage system on the front of the pack. You have a large shove-it pocket and when you open it you realize that you have yet another zippered panel inside with a U-shaped entrance to a large front storage space, and still inside of it you have a mesh pocket, plus yet another zippered pocket on the internal side of this U-shaped lid. One of the unique features is the top pocket with a roll-closure system. The pack comes with a rain cover. 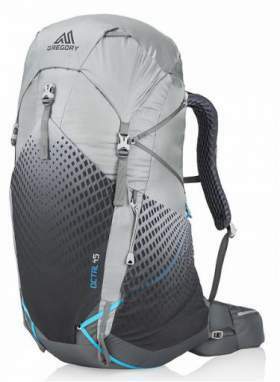 This is a lightweight pack which can take a lot of stuff, great for multi-day hiking and backpacking tours. Please see more in my detailed review. 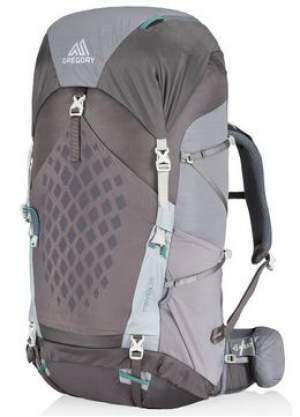 The Deva series includes the packs of 60, 70, and 80 liters, so I am presenting the one from the middle of the series, but they share the same basic features. This is the best known and iconic Gregory series (together with its Baltoro series for men), the model that has received multiple awards in the past. This series has been around for many years already, but they have redesigned it recently so this pack has been further improved. If you need a backpack for serious loads, this is the one, you will hardly find anything more suitable for extended backpacking and hiking tours and for expeditions. You can carry loads up 55 lb (25 kg) and you will do this comfortably. The best part of this backpack is its suspension with a peripheral strong frame and the so-called A3 system, which means Auto Angle Adjust, and this refers to its hip belt and shoulder harness. Namely, the two hip belt sides and the two sides of the shoulder harness rotate independently and accommodate to your body movement. So the pack works with the body and not against the body, and this reduces fatigue and saves energy. Note that you have 5 different sizes for the hip belt and 3 for the harness, which makes 15 different combinations to find the best size that will suit you. The pack also is built in three sizes, and the harness can be positioned at two different lengths, so you have really multiple options for an optimal fit. Other features include no less than 10 different pockets, detachable daypack, rain cover which comes with the pack, 3 access points to the main body of the pack, QuickStow attachment system for glasses, crossover compression straps and much more. Please follow the link to my detailed review. So this was my list of the best Gregory backpacks for women that are currently available on the market. As you probably know, the Gregory brand manufactures only backpacks and new models appear all the time. Therefore, the list will be updated when some new models appear, so bookmark this text and stay tuned. You have seen that those are only representatives of the series so you effectively have far more packs that what is in the list. The Maven includes 4 packs from 35 liters to 65 liters, and the Amber includes 5 packs from 28 to 70 liters, so they are suitable for all these types of tours, just choose the appropriate volume. But the Deva series includes only large load hauling packs and they share the same features. These are expensive packs, top class and very reliable, built to last and to be used for many years. You need a reliable tool on the trail, you do not want a broken buckle on the hip belt or a badly sewn-in shoulder strap that will tear apart from the pack somewhere in the mountains. 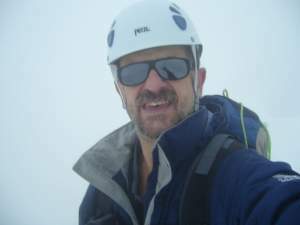 Thank you for reading, note that there is a similar text here in the site with the long list of the Gregory packs for men, so have a look. Please use the comment box below if you have any comment or question. Have a nice day.